Therear face of Luang Phu Prohmma of Wat Suan Himapant Nang Koi (Ubon Rachatani), is one of Thailands Historically famous Gaeji Ajarn Master Monks of the Isan region. He ordained as a Samanera at the age of 12, and learned how to make Buddha Magic at this ripe young age with Somdej Lun, a Khmer Master of Jampa Sak. He studied for 6 years under this Master, who passed away at this point. After the death of his teacher in Buddha Magic, Luang Por Prohm wandered around the country in Tudong practice (aimpless wandering of an ascetic). It was during this time that Luang Phu Prohmma was able to meet and study under the great Arahant Luang Phu Mun Puratto. After studying with Luang Phu Mun, LP Prohmma then went to live in a Cave on the peak of a mountain called Khao Kway, and he remained here practicing in solitary for a period of 45 years. After this, he crossed the bhorder into Thailand in the year 2533, where he went to stay in a cave where he had noticed that many wild animals would come and cross paths and coexist together. He stayed in this cave practicing, and his merits and renunciation became so well known, that even Somdej Prataep Radtana Rachasuda Siam Boroma Rachachonanee (the Royal Princess), travelled twice to pay reverence and offerings to Luang Phu Prohmma. This amulet has the powerful blessings made by a Monk who has practiced in the way of the Lersi for all of his adult life, living in caves and stripped bare of luxuries and comforts, and spending the dark hours in solitude and meditation in the forest caves. A monk who developed his Jhanic powers and the methods of invocations of the ancient Lersi Hermit Gods. Luang Phu Prohmma's amulets are of high credibility, authentic power, and fine quality craftsmanship. The base has a code number of authentic limited edition embossed into it. Made from the finest pure silver, this amulet is quite heavy. 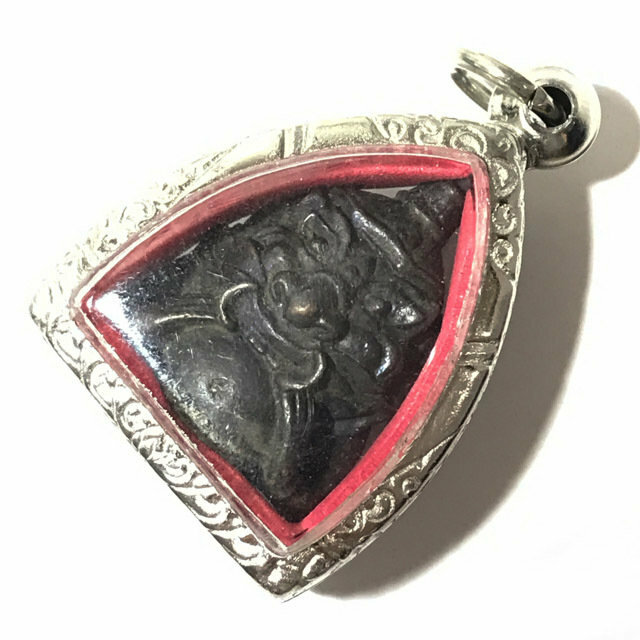 Luang Phu Prohmma's amulets are of the finest and most powerful, but are very rare to find these days, because those who worship Luang Phu Prohmma and his amulets tend to keep them, and are not likely to let themgo again. The Pra Rahu is a powerful protector against physical and unworldly dangers, and is also a very recommendable item for those who like to play lottery, and those who need to break unlucky phase, and convert one's life into an auspicious one. Pra Rahu Protects against black magic, increases power of meditation, gain prosperity, protect from accidents and attacks, promotion in profession, success with less obstacles. Around the year 2536 BE, Luang Phu Prohmma's amulets hit the news in a big way, when a famous politician of Nakorn Sawan Proovince was caught up in a shooting in an assassination attempt, and was shot at point blank range as he sat at a red light in his car. The automatic weapon used to shoot with riddled the car with bullets and the windscreen was totally smashed, but the Politician who was shot was completely unharmed by the bullets. (the bullets hit him, but did not pierce his skin). The politician was wearing a single amulet, that of Luang Phu Prohmma. Since this event, the amulets of Luang Phu Prohmma have more or less disappeared from public amulet marketplaces and showrooms to the greater extent, and the value rose manyfold, making the amulets of Luang Phu Prohmma not only sacred and beautiful, but confirmably powerful, extremely rare, and carry a pricetag that reflects their status. Gae Aathan (remove Black Magic), Gan Phii (scare Ghosts away), Metta Mahaniyom (great preference and popularity), Serm Yos (Increase Status and Chance of Promotion) Serm Duang (invoke an auspicious fate and destiny, horoscope). When you begin to Bucha Rahu Deity, you should make the first ever session in the evening of a Wednesday (any time from 7 pm onwards).After you have done this once, you can make Bucha in the daytime if you wish, but the first time you must include the food offerings of black foods as well as the black incense. The second time onwards only the incense is necessary in the daytime if it is a lot of trouble to get the food offerings.